Samsung Galaxy Ace S5830 is the latest Smartphone from Samsung run on Froyo (Android V2.2 ) with 800 MHz processor speed and 5 MP camera with LED flash. It has TFT capacitive touchscreen and supports 16M colors. 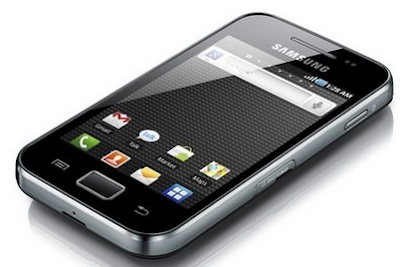 Samsung Galaxy Ace S5830 has 158 MB internal memory, and the storage can be upgraded up to 32GB. It supports 3G HSDPA with speed up to 7.2 Mbps. Samsung Galaxy Ace S5830 support Wi-fi standards 802.11b/g. Its camera support Geo-tagging, face and smile detection. Stand-by battery life up to 640 hours in 2G networks and 420 hours in 3G networks. 11 hours talk time in 2G and 6 hours and 30 minutes in 3G network. Samsung Galaxy Ace S5830 has 5 Mega Pixel camera with LED flash and Autofocus. It has Geo-tagging, face and smile detection features. Samsung Galaxy Ace S5830 has 800 MHz ARM 11 processor with Qualcomm MSM7227 chipset. It has GPS and Li-Ion 1350 mAh battery. It runs on Android OS, v2.2 (Froyo) and has no information whether Samsung Galaxy Ace S5830 is upgradable to gingerbread or not. There is no front camera for Samsung Galaxy Ace S5830. We have no information whether we can upgrade this set to Android V2.3 or not. It does not support 3G video calling. it supports video calling. Is this site is fake? Thanks for your comment. Samsung Galaxy Ace S5830 does not have front cam and thus we can say it does not provide video call. Such a good phone with limited camera features. All we have to do is stand before mirror and start video call by capturing our own reflection in the mirror. Samsung should give away a mirror free with this phone(a big one). My Nokia N73 has front vga camera and killer Carl Zeiss 3.2 MP main camera which is some of the best camera phones ever. Ace is very much user friendly updated fast and more powerful than the nokia N73 in terms of performance,technology and even camera which is 5 mp way better than N73 and it also looks far more better than N73..
Samsung Galaxy is very nice phone as It's OS is android and very user friendly. Nice feature. In this article you will get more information.